There’s a lot of gold in them thar hills. “Gold,” in this case, refers to municipal solid waste that can be recycled, reused, composted or converted into energy. It also includes the waste’s by-product of methane, some of which can be captured and burned for a power source. The “hills” are the nation’s 3,000-plus active landfills, to which 4,600 football fields’ worth of trash are added every year. How much untapped energy still remains in municipal mountain ranges of refuse? About one-tenth of the MSW stream consists of plastics. 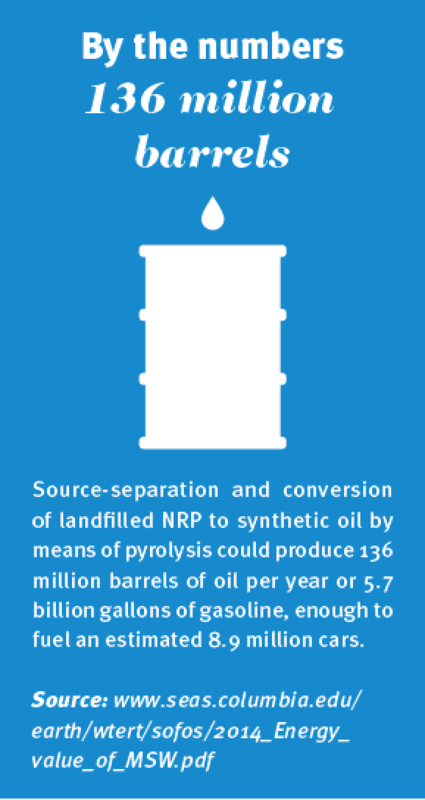 Themelis calculated that each ton of NRP contains the energy equivalent of about five barrels of oil or 1.4 tons of coal. 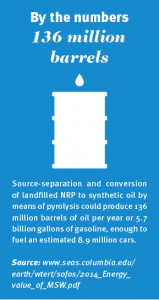 The total energy value of just the annual landfilled NRP equals 48 million tons of coal, 180 million barrels of oil or 1 trillion cubic feet of natural gas. Recovery of all the energy-convertible treasures in existing landfills is neither practical nor cost-effective, because excavating multiple layers of MSW is time-consuming, expensive and ultimately counterproductive. Disturbing the buried trash beyond a surface skimming would result in broken protective liners and a consequent increase in the leaching of harmful chemicals into the groundwater system. A disproportionate quantity of the most valuable refuse is also likely to lie near the bottom of the mound, where it was deposited before environmentally conscious citizens routinely recycled such materials. Extracting it would require a prohibitive amount of digging. Most landfills capture methane for conversion to energy, but “we won’t collect all the methane,” said Themelis. Currently about one-fourth is collected, and ideally about 50 percent could be. Additionally, although recycling efforts have become more prominent over the years, the U.S. still recycles only 20 percent of its solid waste. The rest is dumped into continually burgeoning landfills, testifying that the country has yet to fully realize the importance of fervently pursuing better options. Perhaps the most viable solution to avoid consigning convertible garbage to landfills is the construction of WTE facilities. Waste-to-energy is the process of generating electricity and heat from incinerating waste. That energy can be sold to resident customers or used by the municipality to reduce or eliminate utility costs. Some combustibles can be used to make methane, methanol, ethanol or synthetic fuels. A viable quantity of ferrous and nonferrous metals may be retrieved from the resultant ash, which can also be mixed with cement to produce concrete blocks for shore protection or land reclamation. Gate fees, which are expressed in dollars per ton, are another source of revenue. 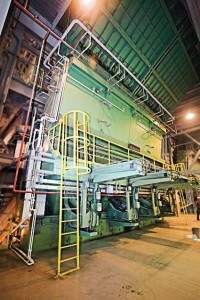 “We have 85 WTE plants in the United States, all operating successfully,” Themelis noted. He advocates an aggressive campaign of building even more. He acknowledged that, given the choice between expanding their landfills and constructing a WTE plant, many communities have opted for the former because “communities usually go for the short term. We build landfills piece by piece, and WTE plants are built all at once,” making the initial cost somewhat of a frightening prospect to municipalities. But, he maintained, communities that built WTE plants 20 to 30 years ago do better economically, generally speaking. So how do you decide whether to expand your landfill or build a WTE plant? Themelis co-authored a practical and comprehensive guidebook in July 2013, “Guidebook for the Application of Waste to Energy Technologies in Latin and the Caribbean,” to answer that question. Although the examples in the study are not from the U.S., he said, the conclusions that were drawn are very applicable here. Several sections of the guidebook describe the elements of the project cycle and provide bullet points and checklists to assist in the analysis and procurement process. Several ownership possibilities present themselves during initial consideration. The municipality alone may finance, design, build and operate the facility. It can contract with a private entity to do so; at the end of the contractual term, ownership is transferred to the municipality. A private company can build and operate the facility, with the municipality purchasing the plant at market value after a certain agreed time. After the feasibility study and procurement process have been completed, contractual obligations must be hammered out. Themelis provides a typical timetable for the project, from the pre-feasibility study through completion of construction, estimating the total time at 72 months. Of course, public acceptance is essential. As Themelis stated, public information campaign must commence at the first stage of consideration and should promote the benefits of the project, address opposition and correct misconceptions.